Sounds like charges to hold them on while they make the case on terror threats. 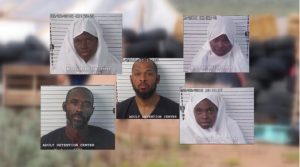 ALBUQUERQUE – A federal grand jury sitting in Albuquerque, N.M., has indicted Jany Leveille, 35, Siraj Ibn Wahhaj, 40, Hujrah Wahhaj, 37, Subhanah Wahhaj, 35, and Lucas Morton, 40, on firearms and conspiracy charges. The indictment, which was filed this afternoon, charges the five residents of a compound in Amalia, in Taos County, N.M., with conspiring knowingly to provide an alien illegally and unlawfully in the United States, possession of firearms and ammunition. The indictment also charges Leveille, a Haitian national illegally and unlawfully in the United States, with possession of firearms and ammunition. The conspiracy charge alleges that the defendants conspired to provide Leveille, an alien unlawfully in the United States, with firearms and ammunition from at least Nov. 2017 through Aug. 2018. The indictment alleges that, as part of the conspiracy, the defendants transported firearms and ammunition from Georgia to New Mexico in Dec. 2017. The indictment further alleges that, between Dec. 2017 and Aug. 2018, the defendants established a training camp and firing range in Taos County, where they stored firearms and ammunition and engaged in firearms and tactical training as part of their common plan to prepare for violent attacks on government, military, educational, and financial institutions.